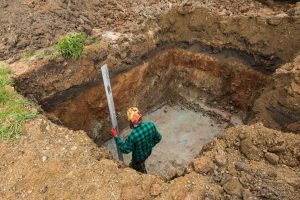 If you have an underground oil tank on your property that is old and/or no longer in use, it needs to be removed. Heating oil tanks made of iron pose environmental risks, raise health concerns, and could negatively impact your wallet. Oil tank removal is a difficult process that should be attempted only by a professional. Due to the tendency of iron to corrode and break down over time, a petroleum heating oil tank that has been in the ground for many years could begin to rust. If this process is allowed to progress, holes could form in the side of the tank, which could allow the petroleum-based contents to spill out and contaminate the surrounding soil and water. Needless to say, a contaminated drinking supply could be hazardous to the health of your family. Other hazardous materials can develop inside a heating oil tank that would warrant oil tank removal, among them the growth of bacteria. Insurance companies in certain areas are reluctant to cover a home that has an old, unused oil tank on the property. This will cause a lot of problems, particularly if you are looking to buy or sell a home or change insurance companies. It is better in the long run to have the tank removed, and removal of the oil tank may even be covered by your current homeowner’s policy. Now that you know why it is necessary to remove your oil tank, you’ll want to know what the removal process will look like. Once you have hired a reputable oil tank removal company, a technician will first do an assessment of the property. The technician will first lay down protective materials to prevent any damage to your home, remove the pipes and pack up the holes, drain any remaining oil from the tank, and finally, remove the tank. Due to the sensitive nature of the materials involved, removal of an oil tank is strictly a job for professionals. Be sure you engage a company you can trust with the use of online reviews or referrals from family and friends.